Synopsis: Simple, small, easy to use, with automatic silence detection that works really well. Records to MP3 or WAV. 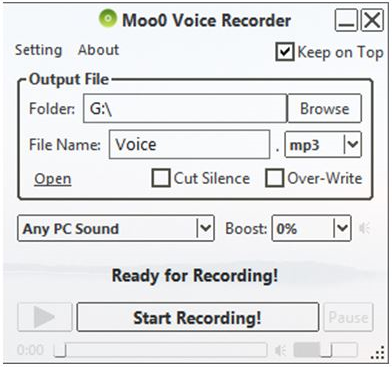 Recommendations: If you're recording voice, lower the quality to at least 64 or 96kbps as the program defaults to 192kbps. Steps: Download and use 7zip to decompress, run VoiceRecorder.exe. Note that Softpedia is listing it as adware so I wouldn't use the install method at all. I didn't test that. License: Free for non-commercial use. Commercial use requires a donation. Wishlist: Ability to save to OPUS, which is better quality and more efficient at medium and low bitrates. You could just save to WAV and use one of several different encoding tools to convert it to OPUS format using LameXP.